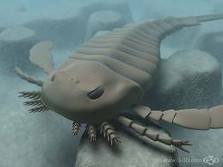 My favorite real sea monster is the Eurypterid, also known as the Sea Scorpion. These fearsome predators were the largest arthropods ever to live- they could grow to over six feet in length! Eurypterids are believed to have crawled along the seafloor using their pincers to grab trilobites and other prey. Sadly (or fortunately, depending on your perspective) these impressive predators have been extinct for hundreds of millions of years.